Meteorological Office, Port Blair is one of the oldest Central Government offices established in Andaman and Nicobar Islands. This office started its basic weather observational operations way back in 01.06.1868. Since then it is being periodically upgraded with more modern observational facilities. It is well known among the local public as ‘HawaGhar’ / ‘Observatory’ and is located at HawaGarh Junction, Shadipur. 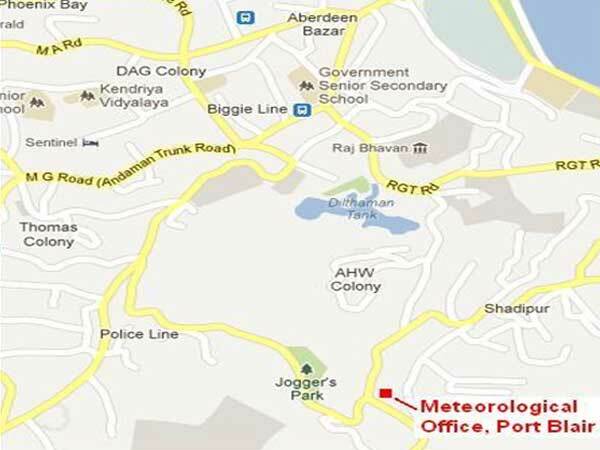 This office functions under the administrative control of Regional Meteorological Centre(RMC), Kolkata of India Meteorological Department(IMD), NewDelhi, Ministry of Earth Sciences, Government of India. The Port Blair observatory functions on round the clock basis(24X7) and it is a part of the Global Atmospheric Watch(GAW) network stations of World Meteorological Organisation(WMO) for monitoring the background atmospheric parameters. In view of the strategic geographical location in Bay of Bengal, various atmospheric parameters observed at this office and also at different part-time observatories functioning across the Islands have significant importance in weather prediction not only for the Islands but also for the country as a whole. It is a well known fact that the Andaman and Nicobar Islands are prone to various natural disasters of Geological and Hydro-meteorological origins. Meteorological Office, Port Blair, plays important role in disaster management by way of providing weather forecasting and seismological monitoring. Apart from this it coordinates with all local administrative stalk holders such as Agriculture department, APWD, Directorate of Disaster Management, District Administrations in weather forecasting services and educational/research institutions like CARI, Pondichery University in academic activities. In addition, this office provides technical support for maintenance of 5 part-time observatories located at other parts of the Islands and collecting weather parameters of these observatories with the active participation of Police Radio personnel and disseminate the same to Regional office, Kolkata and IMD’s HQ at NewDelhi for generation of forecasting reports. Cyclone Warning : Various bulletins are issued at different stages of development of Low Pressure systems and their movement, intensities, weather associated with them and time of land fall etc to Administrators of Andaman & Nicobar Islands and General Public. Seismological Monitoring : The earthquake shocks that are recorded on continuous basis(24X7) at this office are transmitted on real time to IMD’s Real-Time Seismological Monitoring Network (RTSMN) at Delhi which intern shared with other agencies like Indian National Centre for Ocean Information Services(INCOIS). Monsoon Forecast : Provides rainfall forecast during monsoon season at different scales which is quite useful for the agriculture communities and general public. Heavy Rainfall Warning : Heavy rainfall warnings are issued on daily basis to the stake holders(Govt agencies) and public. Maintenance of meteorological instruments installed at Part-time observatories and other agencies in Andaman & Nicobar Islands. Coordinating with the Andaman & Nicobar Islands administration in weather related issues such as Disaster management, Weather forecast for particular events, etc. Surface Observations - Various surface weather parameters such as atmospheric pressure, temperature, wind speed and direction, Relative Humidity, Rainfall are collected round the clock at an interval of 3 hours. Surface Automatic Instruments – Mechanical instruments that records surface Pressure, Temperature, Rainfall, Relative Humidity, Bright Sunshine hours and Wind speed on continuous basis. Upper Air Observations – Twice daily (05.30IST & 1730 IST) observations of vertical profile of atmosphere with the help of GP Sonde/ RS-RW / Pilot Balloon Technique. Automatic Weather Station – Records the atmospheric parameters on continuous (hourly) basis and transmit the same to Data Collection Platform located at Pune via Satellite. Precipitation Chemistry – Analysis of pH, conductivity and various chemical components of rainwater. Seismic Monitoring – Various instruments such as BBS, RTSMN and MEQ are being used for continuous recording of seismic activity in this region. Sky Radiometer – Measurement of Optical Aerosol Depth(OAD) over the station and transmitting the same to Environmental Monitoring Research Centre of IMD at NewDelhi. Radiation Monitoring – Measurement of Direct, Diffusive and Global Radiation data using ARS and Data Logger. The general public may send their suggestions or query, if any, to the office email id imd[dot]pbl[at]gmail[dot]com or kannan[dot]imd[at]gmail[dot]com.